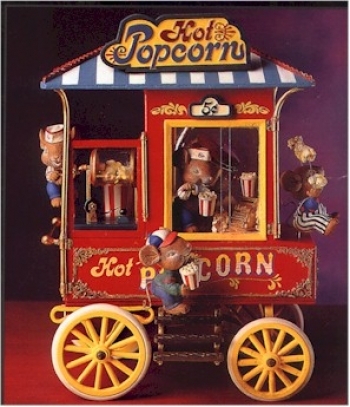 Things are really hoppin' and poppin' at the Popcorn Carnival as kernels continuously pop into puffy popped corn and mice busily move about. As one fellow churns the popcorn maker, another rings-up the orders-to-go. Watch closely and you'll actually see the "kernels" pop about! Plays "Pop Goes the Weasel". 9" high.